In two days' time the Montreal International Jazz Festival starts! To celebrate, The Flower Pot has created the Jazz Bouquet which is a funky arrangement of gerberas and birds of paradise, and comes with a Montreal Jazz Fest program. Montreal's legendary festival dates back to 1980, when the very first edition took place. That summer, Ray Charles, Chuck Berry, Stevie Wonder, and Smokey Robinson headlined. Such a star-studded lineup in the first year was obviously a good omen because our Jazz Festival has expanded ever since, attracting such big names as Ella Fitzgerald, Miles Davis, Paco de Lucia, and Oscar Peterson. In 2000 the Montreal Jazz Festival released a 4-CD boxed set accompanied by a booklet of biographies and notes about the music. The set spans 20 years of Montreal Jazz Festival Concerts. Another way to delve back in time is to visit the wonderful Jazz Festival Mediateque in the Rinto Tinto Alcan building. It is open to the public free of charge and displays music archives, photographs, concert footage, press reviews, publications, and more on state-of-the art computers. It also has one of the best views of the Quartier des Spectacles. Montrealers play host to the world's biggest jazz festival, and as a proud Montreal florist, The Flower Pot celebrates this exciting yearly event with lovely flowers. 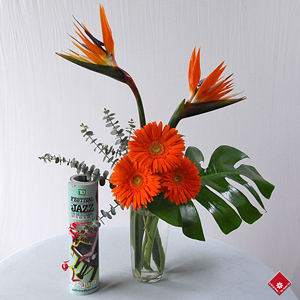 The Jazz Bouquet, pictured here, is only one of our many offerings to the gods of jazz. Our stunning Floral Composition fits the bill as well, thanks to its bright tropical colours, and the Avantgarde arrangement displays a wonderfully different shape with splashes of musical colour from the three red roses. If you're unsure of what to get, be sure that we are always available to help. Call us at 514-938-1234, visit our website or visit us in our cosy Griffintown shop!